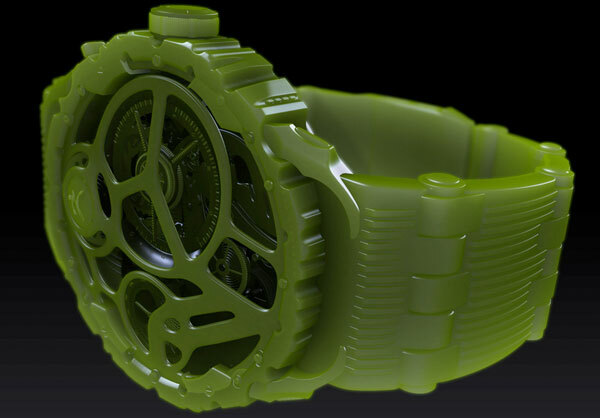 BPR offers many possibilities for creating impressive renders of your models, inlcuding using transparency, sub-surface scattering and depth cue. To explore all the BPR options see the Render palette. The BPR Transparency menu includes all settings related to using transparency with the BPR. With BPR it is possible for a model to be seen through some of its SubTools. (In other words, for a model to be self-transparent.) For example, eyeglass lenses can be made transparent so that the character’s face can be viewed through them. To specify which SubTools you wish to be transparent you must turn on the BPR Transparent Shading switch in the Tool > Display Properties sub-palette. The Transparent option must also be turned on in the Render > Render Properties. The BPR Subsurface Scattering (BPR Sss) menu includes all settings related to rendering Subsurface Scattering when using the BPR. This effect will simulate the light absorption visible in some material types: skin, milk, marble, special plastics and more. Subsurface scattering (or SSS) can be activated for individual lights – see the Lights Properties section for more details. SSS is also controlled through the material modifiers which provide color selection and adjustment of blend effects. See the Materials section for further details.